Immune Monitoring enables the fingerprint analysis of antibody responses upon immunization, vaccination or administration of a biopharmaceutical drug. In contrast to an ELISA, which only states whether antibodies against the antigen are present or not, PEPperMAP® Immune Monitoring breaks down the humoral immune response into high and low immunogenic epitopes. 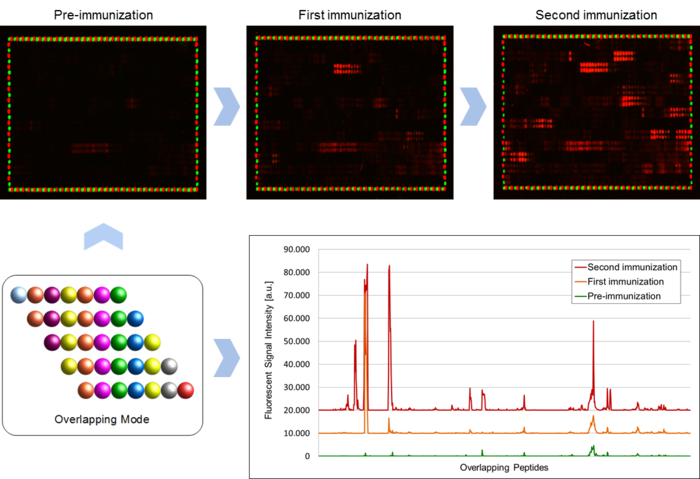 A peptide microarray covering one or more proteins translated into overlapping peptides is first assayed with the pre-immunization sample followed by data read-out. Subsequently, the same array is assayed with the post-immunization sample. Immune Monitoring, hence, allows the clear differentiation of a raised antibody response of an individual from a given antibody status. Moreover, serum samples taken at different time points enable monitoring the time-resolved development of humoral immune responses after immunization, vaccination or drug administration in a uniquely high resolution manner. Immune Monitoring with a single antigen translated into 13 aa peptides with 12 aa peptide-peptide overlap printed in duplicate: The microarray scans after incubation with the pre-immunization serum (top left) and subsequent testing of two post-immunization sera (top middle and top right) clearly highlight the humoral immune response after immunization; the intensity plot (bottom right) shows the increase in antibody binding over time. The signal intensities of the post-immunization samples were leveled to provide a better overview. Stained HA (red) and Flag (green) control peptides frame the antigen-derived peptides. PEPperCHIP® Peptide Microarray analysis is straightforward and can be performed in your own lab or covered by a PEPperMAP® Service. 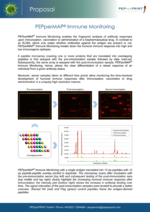 Information about lab requirements for PEPperCHIP® Peptide Microarray analysis can be found here.